Our rock climbing experiences (complete with abseiling) will get you on the gritstone face to test your nerve and skill. You will learn basic rope work and experience both climbing and abseiling in Yorkshire. Feel the adrenaline rush as you scale the rock face. Our Rock climbing sessions take place in the heart of the Yorkshire Dales and are perfect for beginners. We can also tailor the session to give a challenge for those with more experience! In the Yorkshire Dales we are blessed with a fantastic array of gritstone and limestone rocks which are absolutely perfect for climbing. 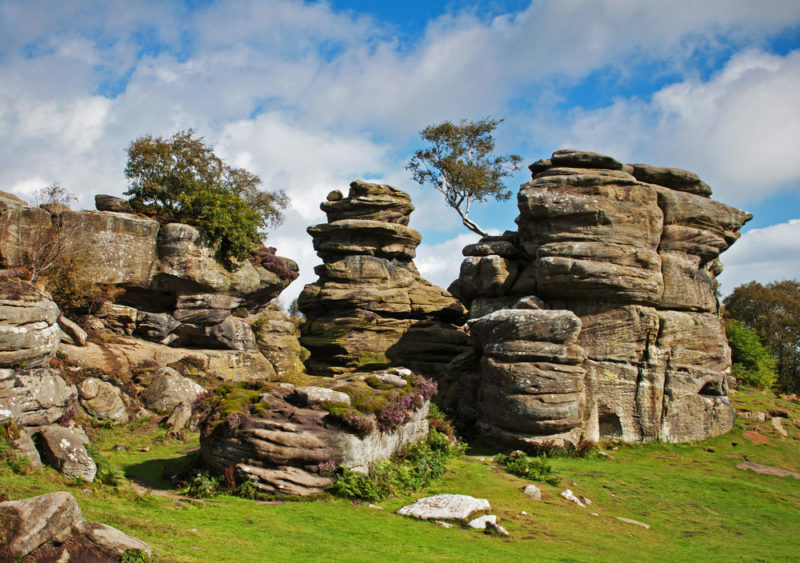 Our rock climbing and abseiling sessions take place at Brimham Rocks, these rocks are famous over their country for their unique shape and labyrinth like formation. The rocks themselves are perfect for rock climbing as they have natural foot and hand holds that make them perfect for beginners, but can also become a bit of a challenge if desired! 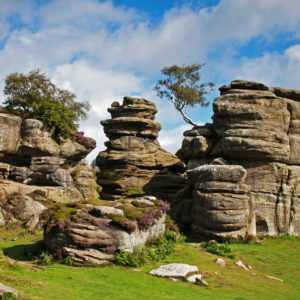 Brimham Rocks are situated nice and close to How Stean Gorge and its a beautiful drive through the Dales to get there. Once you arrive there are multiple opportunities for rock climbing only a short walk away, so you can get on the rocks straight away and without any hassle! Is Rock Climbing a Sport? Rock climbing involves climbing up, down and across (called traversing) natural or man-made rock walls. It’s hard work and physical exertion, so we’d definitely class it as a sport. Rock climbing has even been added to the roster for the 2020 Olympics in Tokyo! Although man-made walls are great fun and can be really challenging, at How Stean we like to climb the real thing. This is why we go rock climbing in Yorkshire at Brimham Rocks! With our instructors present it is completely safe, but gives you the exhilaration that only real rock faces can! No matter if you have climbed before or not we will tailor the 3-hour session to suit your requirements and abilities, under the guidance of our fully qualified instructors. So whether you’ve never put on a harness or you want to challenge yourself at new sites, we know locations suitable for you. Once you’ve tried it we are sure you will want to do it again and again! We can now offer rock climbing here at How Stean Gorge as part of our Via Ferrata & Climbing activity. After you have tackled the Via Ferrata we take you to our quarry where we have top roped climbs in place which scale the limestone walls. How Stean Gorge is a Site of Special Scientific Interest (SSSi) because if it’s limestone formations but we think it’s special for a whole heap of reasons. This 3 hour experience costs £45 per person with sessions starting at 09.30 am and 2pm daily. As Rock Climbing is not based on site we require a minimum of 4 people (or £180) for this activity to run. Please arrive approximately 30 mins early to complete medical forms. You will need a basic fitness level to participate in this activity. This session is completely tailored to you and your group so if you fancy something that will get those arms pumping, that what we will do. Of course! Anybody aged 7 or over can take part. Those who do not take part can watch the climbing. At Brimham Rocks there are suitable places for younger children to scramble over rocks providing they are accompanied by an adult. Also, there’s plenty at How Stean to keep younger children occupied under the guidance of an adult. Because you’ll be climbing at Brimham Rock, you’ll meet the team at Brimham Rocks car park: Harrogate, HG3 4DW. You will just need comfortable clothing and trainers. All safety equipment is supplied but we recommend you bring clothing suitable for the days prevailing weather.